Meet Star-Striker–the inspiration for this week’s delight-directed study. Jason found it, the boys named it, and I grabbed Pet Bugs in a Jar to figure out how to house it. 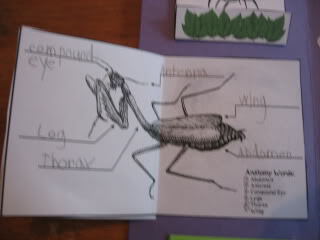 Elijah observed this guy for awhile and decided he wanted to learn more, so I printed off some of the Praying Mantis lapbook from HSS and made him a three-day guide to give him some focus during his study time. 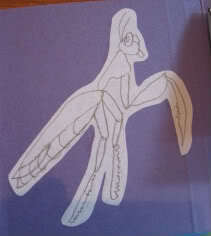 Elijah’s decided that praying mantids are AMAZING creatures (because they are)! Here are a few pictures of opened books in the lapbook. 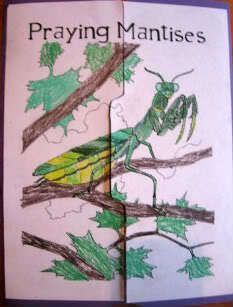 Here is Elijah’s mantis drawing. 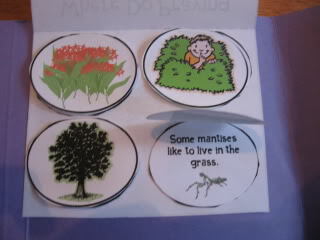 We don’t have any books about these interesting insects, but Elijah did use a few of our resources along with the lapbook including DK Encylopedia of Animals and Ralph Masiello’s Bug Drawing Book. I also included a few websites and videos in the guide I made for him. You do such cool lapbooks! 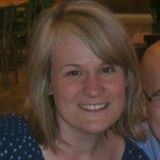 I love your blog BTW and I have a blog award for you! 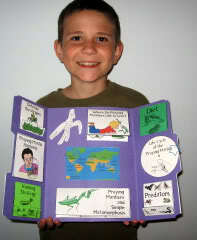 It’s posted at http://www.homeschoolmo.com/2010/09/my-first-blog-award.html. What fun! 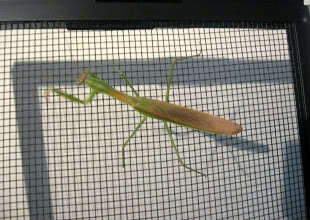 I remember when we did praying mantises. It was really neat learning about them.